Tour de Fat: a celebration of cycles, suds, costumes, and sustainability. A ballyhoo of bikes and beer. Go Go’ers, if you cried tears in your beer at the finale of L.A. Beer Week, celebrated CicLAvia’s car-free streets, and are hyperventilating until Halloween, dry your eyes, drape your cruiser with confetti, put the ring ding touches on this year’s costume, and sign up for Tour de Fat. Sponsored by New Belgium Ale (makers of Fat Tire Ale, natch, plus multiple other tasty brews) in partnership with C.I.C.L.E., Los Angeles County Bike Coalition (LABCB), and the Bike Kitchen/La Bicicocina, Tour de Fat is a family friendly, exhibitionist friendly (Riding around DTLA on a bike in outrageous costume? You are so there. ), and definitely suds friendly bike rally and beer festival with parades, performances, and a slow pedal on a sunny Saturday afternoon. In other words, your perfect, early, eco-conscious Halloween. 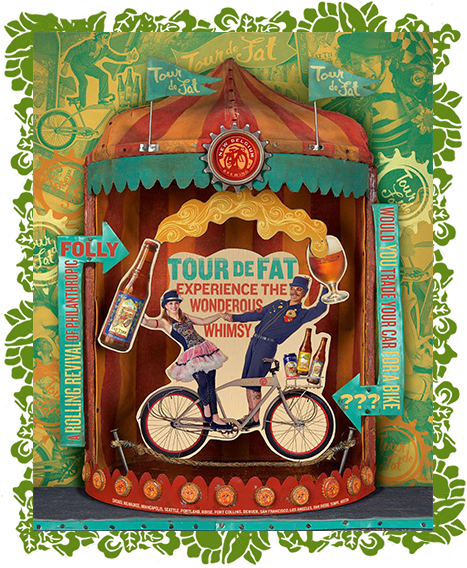 Tour de Fat promises to deliver plenty of boozy, masquerade fun, of course, but super-sustainable New Belgium is also committed to using the festival to get people out of their cars and on to their cycles. Accordingly, at each city on the tour, a hand-built Black Sheep bicycle will be given to a person who commits to eschewing their exhaust-spewing auto for a year of biking and public transportation. The winner’s already been chosen (in a video submitted pre-festival) but the brewery hopes you’ll be inspired to take the petrol-free pledge as well. I love the name Tour de Fat. I think I want it printed on my gravestone. I’m assuming it’s named after Fat Tire beer and is not the 2010 version for Boomers of “Our Bodies, Our Selves”.